The goal of this simulation was to predict the noise emissions due to the feedback loop that develops between the supersonic jets and the Jet Blast Deflector (JBD). The purpose of the JBD is to deflect the hot exhaust up and out of the way of the flight crew and other aircraft. However, it is not well known how the JBD affects the noise emissions of the jet engines. 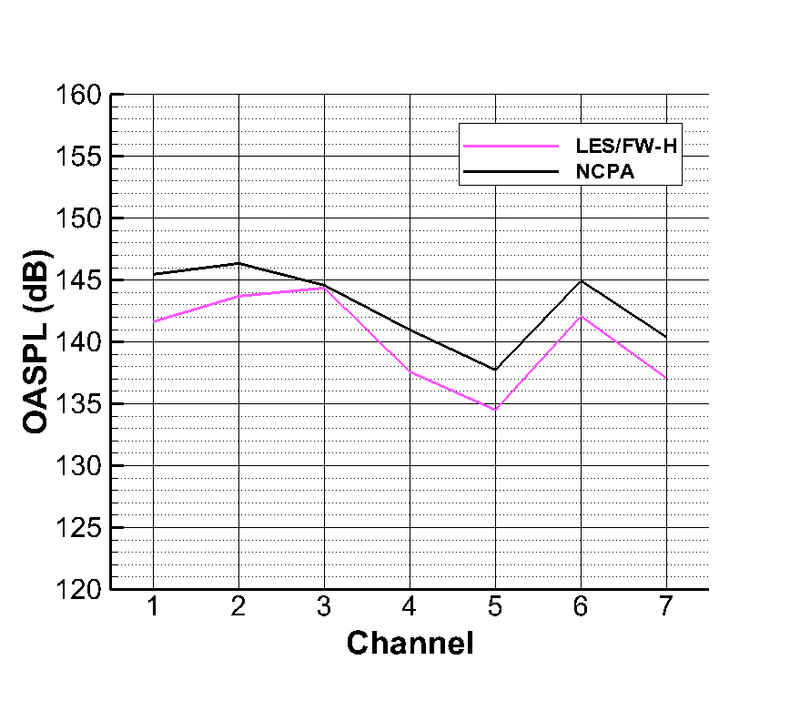 Using the Ffowcs Williams and Hawkings (FW-H) acoustic solver, the LES predictions were used to compute the noise at microphone locations and compared with experimental measurements at University of Mississippi’s National Center for Physical Acoustics (NCPA). The overall sound pressure levels (figure below) agree very well with experimental measurements at various microphone locations. One-third octave spectra is also in agreement with the experiments within 1-5 dB across a broadband frequency range.